This dish is rich with flavor from a quick chili garlic marinade. The shrimp is cooked in a skillet or on the grill, with just enough sprinkled sugar to caramelize the outside of each shrimp as it finishes cooking. This shrimp is finger-licking good straight off the grill or out of the pan. My family tends to crowd the stove while this is cooking and we’ve been known to burn our fingers with impatience to eat the shrimp out of the hot pan. Ben and Nate, my two youngest boys, will eat an entire pound of these shrimp between them and they’ve both chosen it as their favorite recipe in this cookbook. It’s that good. Rinse the shrimp and lay them out on a paper towel–lined tray. Pat them dry. Remove the shells, if desired. To make the marinade, stir together the marinade ingredients. Place the shrimp in a zip-top bag and pour the marinade over the shrimp. Remove excess air and seal. Turn the bag a few times to coat all of the shrimp and then let it rest on the counter for 15 minutes. STOVE TOP DIRECTIONS: Heat a large stainless steel pan over medium-high heat. Add the oil and when it is hot, add the garlic. Sauté the garlic for 1 minute, sprinkle with the sugar and sauté about 30 seconds more. When the garlic is golden and fragrant, add the shrimp to the pan and discard any remaining marinade. Spread the shrimp in a single layer across the pan and let it cook for 2 minutes. Turn the shrimp over and cook an additional 1 to 2 minutes, until pink. Increase the heat to high for 1 minute to slightly reduce any liquid. Remove from the pan when finished cooking. Cook’s Note: The actual cooking time for this recipe is just a few minutes. However, if you do not purchase your shrimp partially peeled and already deveined, allow at least 10 to 15 minutes to prep the shrimp before cooking. Salmon topped with a sweet, tangy and slightly spicy glaze is broiled for just a few minutes, resulting in a fish dinner that just might have your non-fish lovers coming back for one more bite. Drizzle a bit of glaze over the vegetables on the same pan and you’ll have sweet and spicy vegetables along with the glazed salmon. If you start a pan of rice cooking on the stove as you preheat the oven, everything should be ready to eat at the same time. Preheat the oven to broil on high and place a rack in the center of the oven. Line a rimmed baking sheet with foil, if you’d like, to make cleanup a breeze. Pat the salmon dry and place the salmon in the center of the rimmed baking sheet. Whisk together 4 tablespoons (60 ml) of the olive oil and the soy sauce, vinegar, jam, garlic, red pepper flakes and cayenne pepper until mostly smooth. Set aside. Trim the broccoli into bite-size pieces. Place the broccoli in a large mixing bowl, drizzle with the remaining 2 tablespoons (30 ml) oil and sprinkle with the salt and pepper. Toss with your hands to coat well. Arrange the vegetables around the salmon on the baking tray. Generously spoon 1 tablespoon (15 ml) of the glaze over each piece of fish. Broil for 5 minutes, remove from the oven and drizzle an additional 1 to 2 teaspoons (5 to 10 ml) glaze over each piece of salmon and lightly drizzle the broccoli with the remaining glaze. Broil for an additional 4 to 5 minutes, until the fish barely flakes apart. Cook’s Note: If your salmon fillets are larger than 4 to 6 ounces (112 to 168 g), allow an additional 1 to 3 minutes’ cooking time as needed. There are countless ways to make fish tacos, and this lightning-fast method has become our favorite. It takes barely five minutes to cook the fish and the only other time involved is spent stirring together the sauce and slicing or mincing a few vegetables. My kids (formerly fish haters) go nuts over these tacos and will happily eat as many tacos as we allow them to eat. This recipe can be doubled or tripled to feed as many people as you like. Simply wipe out the pan after each batch of fish and repeat as instructed below. In a small dish, stir together the salt, cumin, paprika and pepper. Sprinkle the fish on both sides with the spice mixture. Warm the oil in a large nonstick skillet over medium-high heat. Arrange the fish across the pan and let it cook without touching it for 2 minutes. Slide a thin spatula under the fish and flip it over. Continue cooking for 2 to 3 more minutes. The fish is done when it is opaque and flakes easily with a fork. Remove the cooked fish to a plate. Use two forks to flake it apart gently, leaving plenty of bite-size pieces. To make the sauce, while the fish is cooking, stir together the sauce ingredients and set aside. To serve, place a scoop of fish onto each tortilla. Top with the cabbage and drizzle with the sauce. Sprinkle with cilantro. Serve with the lime wedges on the side. Cook’s Note: If you have the opportunity to stir the sauce together a day in advance, the flavors will develop and meld nicely after resting overnight in the refrigerator; it’s worth the effort. 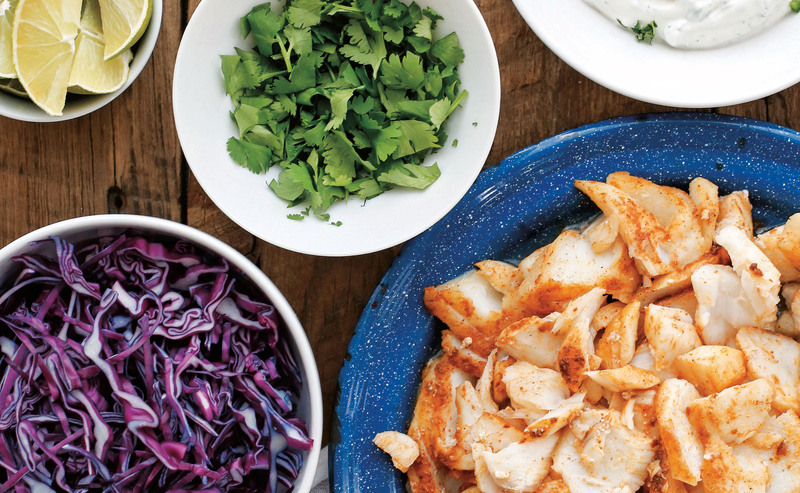 If the Jalapeño Lime Sauce isn’t your thing, the Sriracha Aioli (page 36) is also really tasty with these fish tacos. Recipes excerpted from The Weeknight Dinner Cookbook: Simple Family-Friendly Recipes for Everyday Home Cooking, by Mary Younkin. Cover and book design by Page Street Publishing Co. Photography by Mary Younkin.